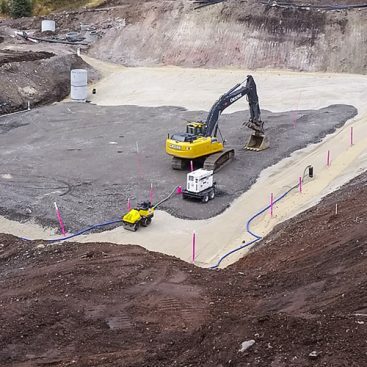 Geo-Solutions was contracted for the installation of a sand filter trench at the toe of Antero Dam in Park County, Colorado. 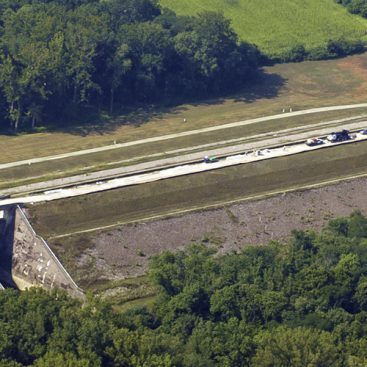 The sand filter trench was designed to filter the seepage of water that has been occurring through the dam. The filter trench will ultimately become part of the chimney drain in future phases of the dam rehabilitation. The project specifications required the use of bio-polymer slurry for the installation of the filter trench. Geo-Solutions elected to use a blend of cellulose and synthetic based polymers for slurry creation. These polymers provided stable slurry that did not require the use of preservatives. The filter trench alignment is along the bench at the downstream toe of the existing dam. The trench is 3,500 feet long with depths ranging from 15 to 23 feet from the working platform. It is keyed 2 to 5 feet into the underlying rock formation, which is a weathered ash-flow deposit similar to sandstone. The trench excavation was completed using a Komatsu PC450 excavator fitted with a 24-inch wide bucket. 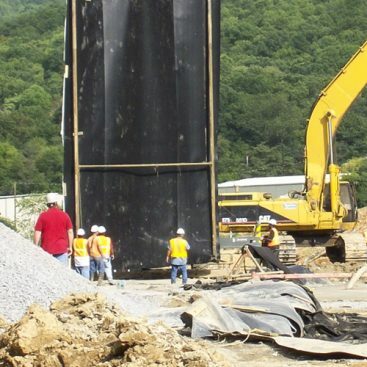 The trench backfill required was concrete sand (fine aggregate) meeting a modified ASTM C-33 specification. The backfill was placed by hauling the sand to the side of the trench using front-end loaders. The sand was then placed in bedding boxes where excavators thoroughly wet the sand with slurry from the trench. A tremie pipe fitted with a hopper was lowered into the trench through the slurry. The sand was placed into a hopper and tremied to the bottom of the excavation. In this manner, the backfill was placed from the bottom of the trench upward, while limiting the potential for segregation. As the excavation continued along the alignment, the tremie was moved along with it. The tremie method was used from the bottom of the trench to 3 feet below the work pad elevation, at which point, backfill sand was placed using the loader bucket directly. An end-stop beam was also used in the trench to keep the backfill separated from the wave-action of the slurry during excavation. During backfill, temporary 6-inch wells were placed in the trench to facilitate slurry “break” and trench development. The bio-polymer slurry was “broken” by injecting sodium hypochlorite in the sand and/or pouring LEB-H enzyme breaker down the wells and circulating with the use of air-lift pumps. Due to a site condition that created platform instability, the sidewalls of the trench caved in near the surface on multiple occasions. The sidewall material was removed from the trench to prevent contamination of the sand with unwanted silt and clay. A series of 30 confirmation split-spoon sampling locations were driven along the alignment after the trench was completed to verify that the sand backfill would perform as intended. The majority of these indicated the backfill sand was cleaned to an acceptable level. One, 100 foot section of the trench was identified for removal and replacement. This work was completed in the spring of 2014. Multiple changes were made to the approach for this section. First, sheet piles were installed at stations 12+40 and 13+40 to isolate the area and to segregate material from the existing trench. The re-dig was completed using a 36-inch bucket to over excavate the previously installed 24-inch wide wall. Guar gum based bio-polymer slurry was used to allow quicker breakdown of the slurry. The trench was again backfilled with concrete sand and mixed in bedding boxes with slurry, placed into a hopper and down a tremie pipe into the trench. Samples of the sand backfill were collected at intervals using a hand auger & sampler to verify no sidewall material was layering in the sand. Four, 4-inch development wells were placed into this section after backfilling using a “lancing” technique. 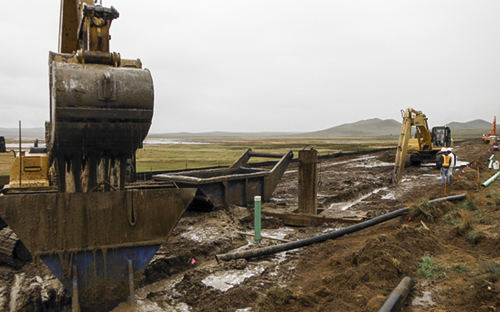 Electric submersible pumps were used to circulate slurry and develop the trench. The quality control for construction included testing of the properties of the slurry, sampling of the material at the bottom of the trench, and laboratory grain-size testing of the sand backfill. Clearing and leveling of the toe-berm of the dam to create the working platform. Installation of silt fence and other erosion control measures. Removal of a section of the existing toe-drain outfall pipes where they crossed the trench alignment. Repair of the 8-inch HDPE outfalls with ADS N-12 pipe including video survey of pipe interior. Installation of a well-point dewatering system at the outfall pipe repair locations to facilitate dry excavation for repairs. Restoration, seeding and hydro-mulching of disturbed areas. A narrow working platform that was adjacent to a protected wetland area. Low permeability sand used as trench backfill requiring longer trench development times. Poor working platform conditions coupled with historic rainfall in September 2013. A corrective re-dig of a 100 foot section of the trench between stations 12+40 and 13+40.